Hunter Kogan is no stranger to pain. For the past five years, he has been in a downward spiral, his days dark and grey. He spends most of his waking hours stumbling through, hating every second, wishing he didn’t even exist. 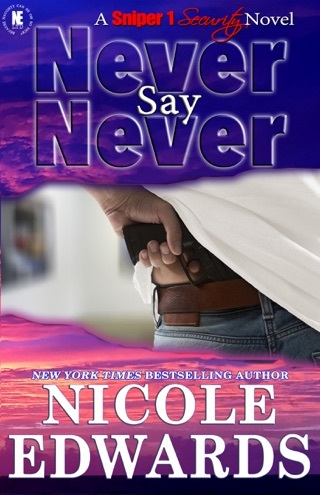 Danielle Davidson was born with a secret, one she knows should never get out. That very secret was what had her running from the only man she’s ever loved. But it seems someone has figured it out, and they want her dead because of it. 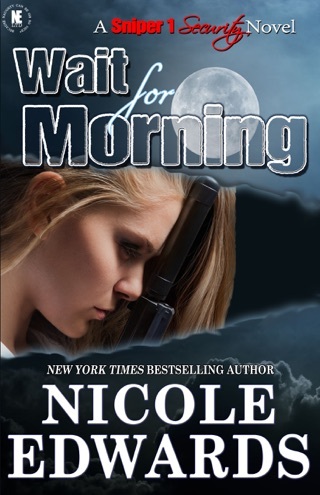 Kye Sterling knows Hunter has a troubled past. He knows someone hurt the man, which is the very reason he doesn’t mind getting close, wanting to ease Hunter’s pain in the only way he knows how. Not that it’s working. Nothing seems to be working. 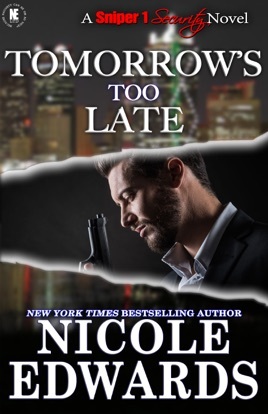 4.5 stars for - Tomorrow's Too Late - book 3 in the Sniper 1 Security series by Nicole Edwards. Three long years have passed since the last book in this series so to say I was excited when this one was announced was a bit of an understatement and it was a truly fantastic read that I devoured over the course of a day! Fans of Ms. Edwards know she pours her soul into these pages and most of her books top out at well over 350 pages so finishing her book in 24 hours is just a testament to how much her writing captivates and intrigues me every single time I pick one up. This is by far her most intricate series to date as well since it has characters showing up from all the other series she has written and while the first book was a M/F romance, the second was M/M and now this one is a MMF ménage so prepare yourself for one heck of a sinful seduction mixed with tons of danger and lots of mystery too. Danielle Davidson is not the person anyone thought she was so five years ago when she ran out on the man she loved she had a very good reason to do so. The fact that he thinks she couldn't handle his darker urges was just ridiculous considering she learned to crave that as much as he did in that short time she knew about them but she never had the chance to tell him as much. Now that Dani needs to tell her cousin the truth about everything and that she may need his help to keep herself safe is bringing her back to the one place she hasn't been in five long years. Kye Sterling watched his family crumble when his brother was murdered for being gay and has taken their overprotective tendencies in stride ever since. Never knowing what happened to him has always ate at him but he has learned to take everyday as a gift and never take it for granted so his "arrangement" with the one man that makes him feel something bothers him to no end. Being openly bisexual himself yet having to be someone's dirty little secret is never something he planned on doing, nor will he accept it any longer regardless of his feelings for the stubborn fool of a man. Walking away from him was his only option but meeting her was the very last thing he ever planned on. Hunter Kogan has always known he was different but kept part of himself closed off from his friends and family. Whether he feared he wouldn't be accepted or worse that was private yet he let Dani in until she decided to walk away on their wedding day. Now five years have gone by and her cousin the dangerous and elusive Max Adorite wants to hire 24/7 protection for her and he knows he and Kye are the only men for the job. He is bound and determined to find out what exactly happened all those years ago and maybe have a little bit of fun along the way.